Export controls pose unique challenges in academic settings—especially in universities like UNL that are home to many experts and students from outside the United States. A university’s primary export is knowledge, but even certain kinds of knowledge are controlled. The Export Control Staff is responsible for determining whether university activities are subject to export and, if so, conducting training sessions on export control compliance and implementing a technology control plan. You may need a license if your research falls into one of the categories described above. Depending on the issuing agency, it may take up to three months (or even longer, in some cases) to obtain a license, so be sure to contact the Export Control Staff before traveling, shipping, or beginning a research project in any of the areas described here. When the Export Control staff determines that a research project or protocol requires additional security measures in order to be in compliance with export controls, it will work with these offices in addition to the investigators conducting the research to implement a Technology Control Plan. 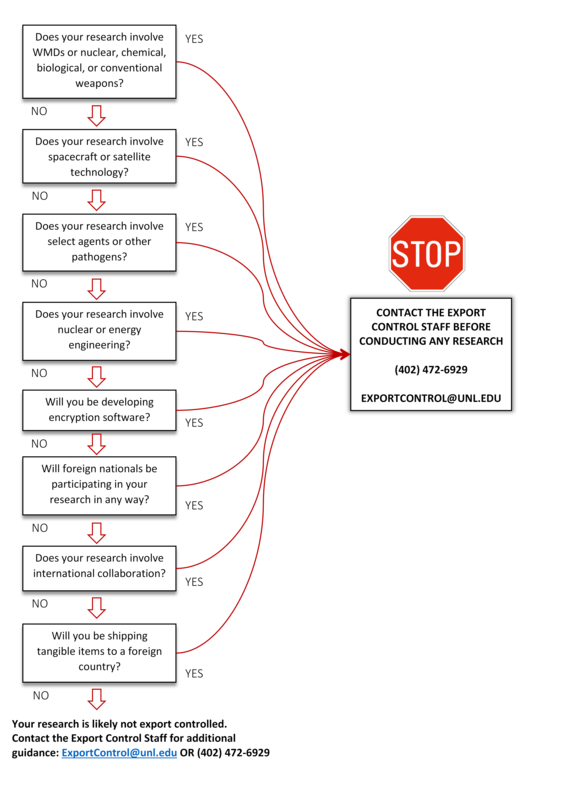 Is my research subject to export controls?